The Amazing 13th Gate Haunted House! 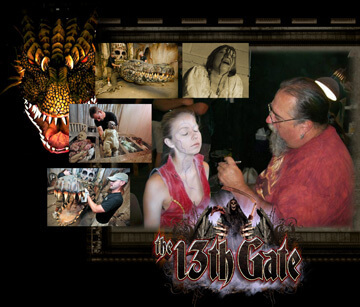 The 13th Gate Haunted House in Baton Rouge, LA has been around for a number of years, but it really popped up on the national radar when the owners submitted some intense video to Hauntworlds latest DVD in 2007. Clearly they had a very cool show, and were doing some amazing things in what some would call “detailing” the haunt. I fortunately got to see the 13th Gate in November of 2007 just after it closed for the season, but before I take you on a tour of the place lets discuss a little bit about what I mean by “detail”. In the haunted house business we hear a lot of words tossed around to describe the craft. One of the most common is “detail,” but what exactly does that mean? To some it means the amount of love and work put into a scene and to some it seems to be how many layers of stuff fills a haunted house. Some feel that too much detail is a waste, and others can never get enough props and effects crammed into their show (I am guilty here!) . Maybe two years ago I went to Rocky Point Haunted House for the first time, and last year I went to the Final Fright Nights held there just before the auction. Was that haunted house detailed?…Yes…but it was in my mind actually something else entirely, something I would call, …Real! And that is exactly what the 13th Gate in Baton Rouge, LA is…stunningly real! In a haunted house producers are trying to scare you, to entertain you, to impress you. We all have different resources at our disposal: the artists that work for us, the vision of the producer, the budget of the haunt, etc. Some focus first on the scares and don’t worry overly much about the look. For those who focus on the look there are also many ways to go. Most of the really great haunts I have seen are surreal environments filled with total sensory overload. Animations lunge out from every corner; theatrical lighting, strobes and black light reveal scenes filled with monsters, props and heavily detailed walls. Often haunts like this have tons of high quality props and sets, but it would be hard to mistake the sets as real. 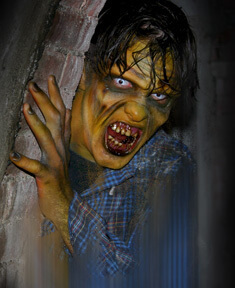 The abundance of creepy static figures, special effects, loud noises, colorful lighting, lasers and strobes, air cannons and animations make these events amazingly cool and scary, but almost more like souped up versions of traditional dark rides, rather than actual abandoned haunted places. For 13 years Dwayne and Kathy Sanburn had been building haunted houses. Their company Midnight Productions was named because they were always “up after midnight” working on the sets. But after many years of temporary shows, they were still unsatisfied. They needed a place they could work on year round, a place they could really sink their teeth into. In 2001 they were able to lease a 40,000 SF building in downtown Baton Rouge, hours from their home in Alexandria, LA. The place was seeped in history…actual slave shackles were discovered when they built the outdoor swamp. After 11 months of construction they opened the 13th Gate, a huge, elaborate haunt with 13 “themed” areas. Brimming with cool sets and clever scares, the haunt was a success, but Dwayne still wanted more. In 2005, they visited the set of the horror film “The Reaping” starring Hillary Swank, shot in Baton Rouge. 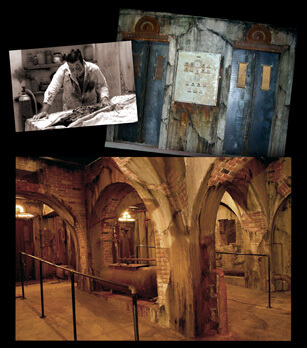 Inspired by the production design, he hired the film’s scenic artists to work at the 13th Gate, building sets and teaching movie style techniques to his already talented staff. From that point onward they began a transformation of the already impressive haunted house into something even greater. After seeing the footage of this haunted house on the latest Hauntworld video I had to see it in person. October is a bit busy for me as you might imagine, so in early November a few days after the 2007 season wrapped I hopped on a plane headed for Louisiana. Although they were closed for the season, I got a guided tour of the place, accompanied by some classic southern hospitality. What follows is an account of the haunt’s sets and scenes in November 2007. Amazingly Dwayne and his crew began rebuilding and renovating soon after I left and were deep into construction by December! The buildings (The haunt is housed in two adjacent structures) are old, creepy and painted black. A Scarefactory Slayer lurks on the structure’s roof, announcing to all who pass that they have found a haunted house! When you enter the building the wow factor starts at once, as even the ticket booth and gift shop is richly decorated. 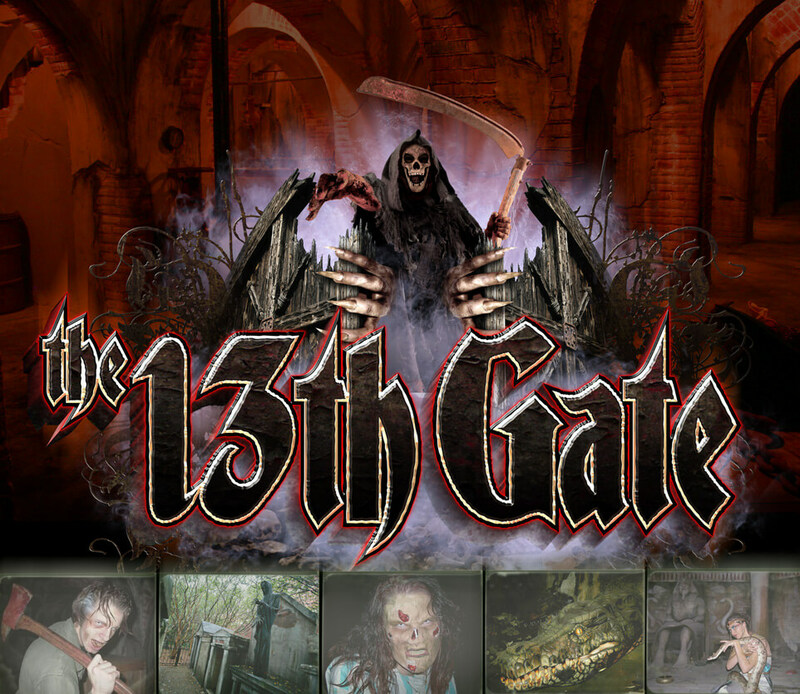 The entire show is themed as 13 different areas, thus the name The 13th Gate. In 2007 they converted over 4000 sf into a ticketing area, and queue line, now known as the 1st Gate or The 13th Gate Shipping Company. The best way to describe it would be to compare it to the boiler room queue at Disney’s Tower of Terror. The entire area is themed as a dank industrial basement. Guests wind through pillars and arches of cold brick and decaying plaster, encountering giant rusty metal machines at every turn. Rust, rot and green algae drips down the walls, that when touched are hard and cold, actual plaster and cement not latex or vacuform. Oily liquid churns behind a bolted portal on one device, and aged crates bound in rusty chains litter the perimeter. At the edges of the room, dirty burlap sacks hanging from the ceiling occasionally twitch, and a vast collection of nasty ancient farm tools and a rough hewn coffin are on display. The focal points of the room however, are the four elevators at its center. Guests enter two of them in sequence while periodically a third reveals a terrifying surprise. When the room fills up with guests, the staff triggers a special sequence that is particularly terrifying. The lights flicker and slowly dim as a MASSIVE air tank in the center of the queue fills it tanks. Once the room plunges into total darkness the air is released with a huge blast, to great effect! The elevators are spot on perfect, with all the dials, lights and extras you might expect in an aging freight elevator. As you begin your simulated descent however, there is an extra surprise waiting. Dwayne and his crew dug 2 huge tunnels below the crawlspace of the building ! Over 50 feet through muck mud and old concrete was tunneled at angle for EACH elevator. With the use of massive mirrors and clever lighting the result is an apparent bottomless elevator shaft! Before the simulator sequence begins, a lighting change shows you the pit beneath the metal grating that serves as a floor for the elevator, freaking out those afraid of heights. This accompanied by some sideway motion makes the elevator drop even more effective. Exiting the elevator you travel through more tunnels of decaying plaster past an enormous rusty industrial fan into the 2nd Gate, The Insane Asylum. This section has many scenes you might expect for the theme, and boasts a fair amount of human scale animations. Some of the rooms include a grisly maternity ward, a room of doors, padded cells, and a morgue scene. Notable here are the many actual medical devices on display, and the level of grime the set dressers have layered the place with. Next is the 3rd Gate, The House of Wax. Representing a classical theatrical Chamber of Horrors, the sets here cater to many scary films from the classics to the present. Displayed prominently is the lab of Dr. Frankenstein, complete with elaborately carved castle stone walls and an antique electroshock machine. Tableaus from the Phantom of the Opera, and American Werewolf in London are also decked out, with ample theatrical curtains supplied for actor attacks. Perhaps the most notable is a scene from Freddy vs. Jason. Two spot on replicas are posed in mid battle from the film’s iconic boiler room smack down, with a cascade of real water separating the combatants. During certain nights of the run, the large population of repeat guests got an extra shock as the normally static Jason or Freddy had an actor in place instead! Exiting the House of Wax we came to the 4th Gate, a Claustrophobia Tunnel. This popular effect well known to haunters, is a system of airbags that provides a feeling of being “buried alive”. It made a nice transition to the 5th Gate The House of the Dead. This sequence portrayed a standard house with a bedroom, dining room, etc. As you enter, a TV set is playing news footage of a zombie attack, mentally preparing guests for the carnage to come. In addition to the elaborate sets found in the 13th Gate, the haunt also possess a very skilled make-up and costuming department. This crew spends extra care on the zombies in the House of the Dead section, making sure they are extra gory and nasty to really freak out the patrons. In perhaps the marquee scene in this area, one actor is set halfway into the floor with fake intestines trailing off of him. The zombies then as tradition dictates have fun chewing on his quivering entrails as he screams in agony! Even more blood flows in the next sequence, the 6th Gate, The Slaughterhouse. Scenes include a body bag room, lots of mangled meat, and a gory kitchen. In this display a crazed killer hacks at flesh only to have it spray guests with a blast of water. In the dim lighting it totally sells as blood for a nasty effect. But the big scares come as the guests emerge into an outdoor section of the show. Now they are herded like cattle though a wooden fenced paddock as chainsaw operators go for the kill! Escaping the chainsaws patrons discover the 7th Gate, The Voodoo Bayou. Here guests wind though a real swamp (Easy to grow in Louisiana!) with trees, foliage, and slimy water. A series of suspended foot bridges takes them through several small rustic cabins littered with antiques from the Civil War era. In one hut a bubbling pot is tended by an old witch casting spells, but darker dangers await. Passing along one of the bridges, guests are assaulted by water cannons hidden in the slimy water! Before exiting the swamp one more effect is seen, an animatronic hangman. Now begins an amazing sequence of graveyard environments begun by the 8th Gate, The Crematory. First guests must crawl into an oven simulation complete with smoke, fire effects and a crispy corpse! This leads to a full size hearse that they exit from, into a mortuary set much like that from the original Phantasm film. From a tight space to this vast expanse they walk once more into the outdoors into breathtaking 9th Gate, Resurrection Cemetery. This zone is so realistic you would think you were in an actual New Orleans graveyard at night. Brooding above ground tombs surround you, bricks revealed by the crumbling masonry. Actual wrought iron spiked fence toppers jut from the mausoleums, the rust staining the stonework beneath it, mixing with the algae and rot. As you maneuver this maze of crypts, all around you are hidden gaps in the stone work for zombies to reach out. Entering one crypt, an actor grasps from above, concealed in the vaulted ceiling. All about the standing tombs behind a rusty fence is the graveyard. Filled with many headstones, the entire area is dappled by the moonlight that filters down through the actual trees planted there. The wide paved stone path leads to a long dark concrete tunnel 60 feet long, tight and rounded at the top that takes you inside the building once more. This tunnel ends in the 10th Gate, Xibalba: The Mayan Underworld. In many ways this was my favorite area, not only because of the amazing execution of the sets but also because of the unusual themes explored. The area consists of several large high ceiling rooms with ascending ramps. Everywhere are tilted columns and ruins, with vines spread among them. Three chambers were the most dramatic, the first being the room of skulls. This was a round room, maybe 12 feet across, 12 - 16 feet tall. Except for the small entrance, exit and a jute covered actor spot, the entire surface was covered with hard plaster skulls set in concrete! It was stunning to see so many (thousands) of skulls piled stack upon stack. And when you touch them, they are not cheap plastic or rubber but cold, cold stone. Venturing deeper in, you discover an altar to a Jaguar god, no particular gags, just an amazingly realistic set. Finally you head out on a rickety bridge over a large pit like room. In the center of this room is a massive alligator animatronic emerging from a tunnel, topped by a colossal ornate stone skull. This gator is as huge as an elephant, (well a SHORT elephant) snapping its jaws and bellowing loudly as you traverse the bridge, and just as you reach the center the whole thing tilts as if to dump you into his gaping maw! Next on the archeological expedition comes a descent in to the 11th Gate, The Tomb of Naja. Like the Mayan area this is a set of large high ceilinged rooms, but this time with an Egyptian twist. Sand covers the floors making walking tricky and large sandstone like blocks and carvings cover the walls. Three memorable rooms comprise the area, along with several tomb displays. In one of the rooms the walls slant together in a very claustrophobic style, and a giant stilt walking Anubis tomb guard chases trespassers. In another an elaborate back drop of statues and columns is filled with realistic snake models, and often features an actress with a real python wrapped around her. In the final area some of the 13th Gates famous animal actors make an appearance. Guests must walk under a Plexiglas ceiling covered with live snakes! For those with snake phobias this may be too much to take! The penultimate zone is the 12th Gate, known as Davey Jones Locker . This section is a tribute to both the Pirates of the Caribbean films, and to the late great Rocky Point Haunted House, but with if it can be believed…. a few improvements! Guests first pass through a huge treasure cave (formerly the lair of a giant spider in previous years) up a ramp into a swamp. Then past mucky water and dead trees into the detailed shack of the witch Tia Dalma. This set is brimming with every imaginable detail, but the best is yet to come! If you remember the rocking pirate ship at Rocky Point, you entered through some passages and were just suddenly in the ship. At the 13th Gate, you actually enter from a pier! You see the side of the ship, cannons protruding, rocking gently in the sea. Down below the pier you see the wash of water lapping at the ships sides. Careful placement of mirrors suggests the ship interior is twice the size it appears to be. Several different interior rooms make up the ship, very close in style to the sets in the films. After exiting the ship you come across a colossal Kraken (Giant squid) attacking the dock. Although not as animated in 2007 as Rocky Points attacking Kraken was, it is massive with an over 12 feet wide maw of vicious teeth, and huge twisting tentacles. Now guests must travel down a long wooden corridor, the walls covered with rotting corpses. They are ushered into a huge cage fifteen or so at a time to experience the 13th Gate, The Dragons Lair. The gates of the cage open, revealing a 50 foot tunnel to the end of the haunt. Even as the escape route is revealed the back of the cage cracks open and the head of a massive dragon bursts into the cage! As the patrons run for the exit, the dragon follows all the way to the finish. Hot on their heels it blasts smoke, roars and chomps at them! Finally it retreats back into its lair and the cage is filled once more with guests. The 13th Gate is an amazing haunt, one of the best I have ever seen. Although in parts it may resemble other shows in theme and style, the absolute dedication to make it look totally REAL and solid in certain sections is breathtaking and extremely impressive. Also not to be ignored are some of the huge unusual technical effects such as the Gator, The Dragon, the Ship and the Elevators. There are many tastes in haunts, the dark non-detailed type, the surreal packed with detail mega- haunt, and this sort, a type that will on occasion absolutely put one in a setting that seems totally real. That and the obvious love the producers put into every corner of this place make it a must see for any haunt fan. 1) How did you get started? I wanted to own a haunted house when I was 15 years old! When I was 25, I graduated Nursing School and worked in ICU at the VA Medical Center to make enough money to open my first Haunt in Alexandria, LA. 2) Tell us about your earlier haunts. Louisiana Nightmares Haunted House was my first haunted house (Alexandria, LA). It was open for 12 years. In 1998, we also started creating portable haunts for LSU campus in Baton Rouge and built a newly themed haunt each season up to 2001. 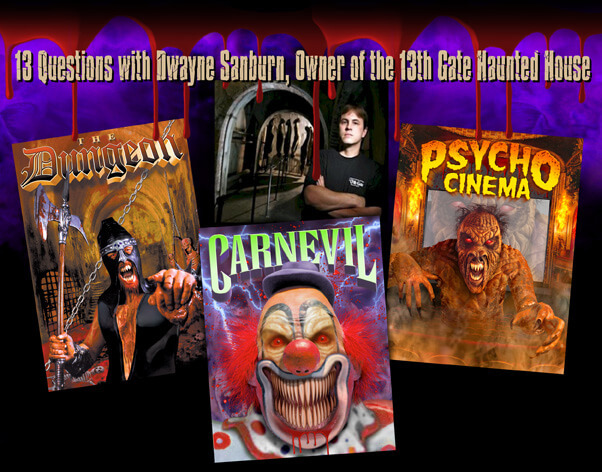 These included "The Dungeon”, “Carnevil”, “Carnevil II”, and “Psycho Cinema”. Although the show was a success, I started looking for a permanent location in Baton Rouge to house a much more ambitious haunt. In 2002, we opened "The 13th Gate" in its current location, 832 Saint Phillip Street, downtown Baton Rouge. In 2001, we also added a haunted corn maze in Alexandria to Midnight Productions attraction list. 3) Where do you get your ideas? I am constantly looking for that "next big thing" that the public expects to see each October. I find ideas from Horror movies, theme parks, video games, trade shows, and the Internet. 4) What are your inspirations? Rocky Point Haunted House was a great inspiration to me last year since it was the first haunted house that I had been to that built in the same style that I use. Another inspiration is movie sets. Because of certain tax breaks, the movie industry in Louisiana is currently booming. This has given me the unique opportunity to visit several movie sets and see first hand how Hollywood scenic artists build and design amazing environments! 5) You use live animals such as snakes in your show. Any advice on using animals in a haunted house? First and foremost, it is not for everyone. Using animals in a haunted house involves a tremendous amount of work, expense, and dedication. If you decide to use animals in your haunt, find an expert to help you design a proper habitat and assist you in their continuous care. Although we use rats and large roaches in the haunt our main focus has always been snakes. During October we house around 500 live watersnakes at The 13th Gate. Because this reptile is indigenous to Louisiana, they are easier to obtain and keep and are a great scare for many people. 6) Most haunts build primarily with temporary panels, but you seem to build lots of special use permanent sets. Are they difficult to build? Any advice for those who want to try that style of construction? We tend to use real world materials (plaster, concrete, bricks, etc,…) which are not as easy to remove and change up every season as a temporary portable show would be. Building in this fashion requires a lot of construction time and labor and tends to be a more expensive way of creating a haunted house. However, we have found that overall our rooms turn out looking very very real which in turn totally sells the idea that patrons are NOT in a haunted house but are in a real haunted environment. The more they buy into this concept, the easier they are to frighten. Also for us building realistically has had a more mass appeal. When we started building in this fashion our customer base broadened to include an older market (effectively doubling our attendance). 7) Do you have a year round crew? I have been very fortunate to have a small year round crew of very dedicated artists. We employ several amazing scenic artists (Blain Quam, Anthony Henderson, Joe Martin) a technical director (Scott Meyer), and several scenic carpenters (Chris Hett, James Linceum, Arron Comeaux). We also hire quite a bit of seasonal construction help and my wife, Kathryn, as well as several members of my family, are always working at the haunt. 8) Do you build some of your elaborate technical devices in house, like the Dragon and the Elevators? Although we do outsource some of our custom work (such as to Total Fabrication or Composite Effects), a lot of our mechanical effects were designed by myself and constructed by our very talented technical director, Scott Meyer. 9) You have a very elaborate make up and costuming department. Can you tell us more about them? Our head makeup and Airbrush artist is Blain Quam. We also hire 8 other makeup artists during our season to apply combinations of airbrush, greasepaints, and appliances to over 80 actors each night. We are also lucky enough to have the guys from Composite Effects (Ken Decker, Wes Branton) working with us to create some outstanding custom makeup effects and props. Our stage manager, Jamie Schexnayder, along with assistant stage managers, Kelly Stone and Brian Longstreet, oversee our costume department. Together they tackle the huge task of managing the costuming (and personal) needs of around 100 cast and crew members each night. 10) Where do you get your actors? LSU is only a few miles away so we tend to attract a lot of University theatre students. Additionally, because of our aggressive marketing and audition process, we also have a very strong core group of professional actors. 11) Why is the show called the 13th Gate? The show is named after a mysterious Mississippi river-based shipping company that operated at the site many years ago. Because of the number 13 in the title, as well as the size of our attraction, we decided to create 13 uniquely themed areas to our haunt. 12) Is it tough running a haunt in the Bible belt? It doesn’t seem to affect your famous neighbors, THE HOUSE OF SHOCK. I hear you visit each other every year…. The 13th Gate has never had problems with religious groups. We tend to shy away from controversial themes and stick to mainstream horror to frighten our guests. 13) What new things do you have planned for 2008 that you can tell us about? 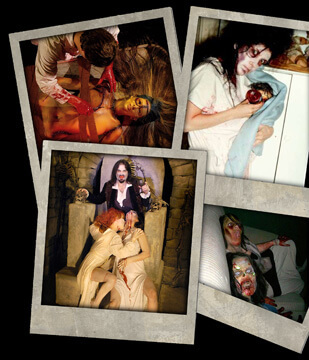 The 2008 season will see us open one night in April for Hauntcon. During this time we hope to debut our new 13 room Asylum. Built around a central hallway and designed to resemble a real abandoned asylum, this will be our most detailed creation yet. We also are planning an extensive sewer system based loosely on the movie “IT” and a revamping of our already elaborate swamp outside.